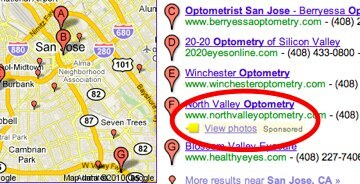 Google is killing Tags, an advertising product for local businesses which allowed them to enhance their Google Maps or Places listings. For a flat $25 monthly fee, local merchants could make their their natural listings stand out a bit with a yellow tag and a few words pointing to offers, photos, menus, or links back to their website. Tags were introduced with Google Places, the search engines local listings effort, about a year ago after being tested for a few months. Seems google is killing this offering. Must be a part of the recent restructuring. It was doing pretty well for my company too, I’m pretty bummed about it. While it’s true that Local is now under senior VP Jeff Huber, there is probably a simpler explanation for why it is getting sunsetted. Tags was an experiment which led to a similar local advertising product called Boost which appears do be doing much better, judging by how much it is now appearing in search results. 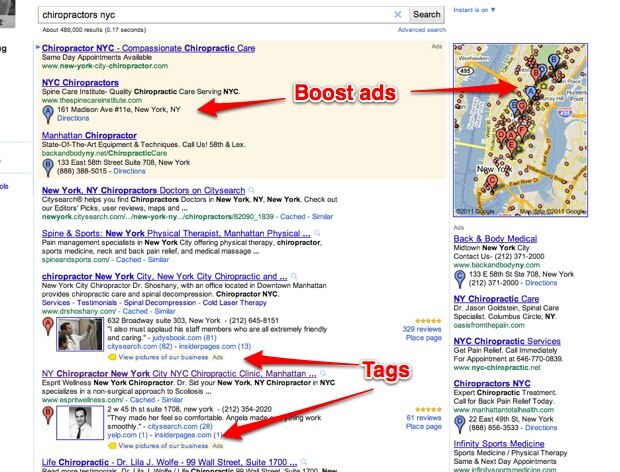 Boost ads are all of those blue-colored pushpins on Google Maps and in paid search results. Rather than linking to a website, an offer, or a menu, Boost highlights some listings information from Google Places such as an adress or phone number. These are much more useful, especially in mobile search. Merchants don’t want to drive clicks to their websites, they want to drive foot traffic to their stores or calls for their services. Also Boost is a very straightforward online advertising product. Merchants set a budget and pay per click, whereas Tags appear next to organic results to make them pop and were sold via a flat subscription. Boost is basically a refined version of Tags, and that’s what Google is going with. For local businesses that like tags, they can still buy them across a dozen competing non-Google sites through Yext Tags. A tag and customized message can be added to any local business listing on sites like Citysearch, Local.com, and SuperPages, Incidentally, Yext is planning on changing the name of this product to on Monday to PowerListings.